On Monday morning, December 10, 2018, the Lord called Emma Ellen Irby Bland from labor to a peaceful rest at her home in Blackstone, Virginia. Emma was born on January 17, 1914 in Lunenburg County. She is the daughter of the late Harry and Emma Bates Irby. Her siblings who predeceased her were William Irby, Catherine Irby, Jennie Irby, Dorothy Johnson, Henry Irby, Margaret Washington, and James Irby. She is also predeceased by three grandchildren, Rodney Farrar, Angela Delaney and Ricky Delaney. Emma was educated in the Lunenburg County School System. She worked in the Richmond, Virginia area as a domestic housekeeper for a number of years. Later in life, her job search took her to the Piedmont Sanitarium (Piedmont Geriatric Hospital) where she remained until she retired. In 1933, Emma was united in holy matrimony with the love of her life, Soland Bland. To this union, six children were born, of which three are deceased, Edith Bland Farrar (George), Soland Bland, Jr. and Earl Bland. At an early age, Emma accepted Jesus Christ as her personal Savior. She was a member of the New Bethel Baptist Church. Emma served as president of the senior choir for a number of years and worked diligently to uplift the name of the Lord. We were amazed when she could still recite her favorite scripture Psalm 23 in her late 80’s. Emma was affectionately known as “Lil Emma”. She was loved by everyone who knew her. 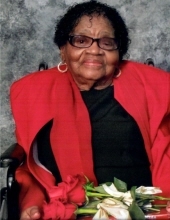 She leaves to cherish her memories, her beloved daughters, Mildred Stanley (William), Blackstone, VA; Shirley Jasey (Lloyd), Richmond, VA and Barbara Rumph (Isaiah), Blackstone, VA; Sister, Mary Forte (Hyman), New York, NY; Grandchildren: Sandra Branch (Ralph), Carolyn Farrar, Patricia Bagley, Warren Farrar (Doris), George Farrar (Karen), Randal Farrar; Emma Bland, Soland Bland, Darnell Bland; Toni Nash (Thomas); Eartha Allen, Sala Bland, Eva Bland, Sean Bland; Jackie Geter (Gerry), Allen Bland, Robin Bland, Crystal Stephens (Marcus); Lisa Summers (Frankie), Gwendolyn Delaney, Darin Delaney (Aishah Pought); Great grandchildren, Great-Great Grandchildren, Great Great-Great Grandchildren, nieces, nephews and cousins. A heartfelt and special thanks to Elaine Eppes, caregiver, who showed love and compassion when caring for “Grandma” as she called her. A special friend Elizabeth Roberts. Funeral Services Saturday, December15, 2018 at 1:00 p.m. at New Bethel Baptist Church, Crewe. Interment Hurte Family Cemetery. To plant a tree in memory of Emma Irby Bland, please visit our Tribute Store. "Email Address" would like to share the life celebration of Emma Irby Bland. Click on the "link" to go to share a favorite memory or leave a condolence message for the family.